We’ll be enjoying another epicurean Bike Fun outing this Tuesday on the Poky Pedaling Potluck Picnic. This popular monthly ride, now in its fourth year, always tickles the taste buds of Poky Pedalers. The Poky Pedaling Potluck Picnic meets on Tuesday June 2 at 5:15 PM in Goerke Park near the entrance to the swimming pool. From there, we will ride between 3 and 5 miles on calm streets and non-motorized paths to a mystery park location – always different on each PPPP – where we’ll spread out all the picnic contributions and enjoy our feast. Poky Pedalers should each bring something to share for the potluck picnic. Those so inclined can make a fancy salad or main dish or dessert. Others may prefer to simply bring a bag of carrots or a jar of pickles or a bottle of juice. Regardless of the amount of preparation effort, all food and drink contributions are equally appreciated. Note that PPPPs are always alcohol free. As always, I will bring plenty of my vegan Poky Pedaling Potluck Picnic Palate Pleasin’ Potatoes, otherwise known as the 7-P Salad. I also bring enough plates, cups, and utensils for the entire assemblage of Poky Pedalers, although you are always encouraged to bring your own. For those uncertain how to carry your picnic contribution on your bicycle, simply give it your best shot. If that doesn’t seem to work, there’s always plenty of extra carrying capacity among our group. As is the case for all Poky Pedals, the PPPP is free and all Poky Pedalers are welcome. For those who have never been on a PPPP, you can read more info about how they proceed here. This page also gives a few more suggestions about picnic contributions. And a more general discussion about what to expect on any Poky Pedal can be found here. For this Tuesday’s PPPP, I have arranged for us to visit a special post-picnic destination. I don’t want to spoil the surprise, but I will hint that this extra theme is bicycle-oriented and very creative. I’m pretty certain Poky Pedalers will enjoy this extra dose of Bike Fun. We’ll probably spend about 20-30 minutes there, so we should still have plenty of daylight on our subsequent return to Goerke Park. And this surprise destination is directly on the route back, so it won’t cause additional mileage for our return trip. The weather for Tuesday evening looks fabulous: oodles of sunshine, 70 degrees, and a light breeze. It should be a perfect night for a special PPPP that includes post-picnic Bike Fun. 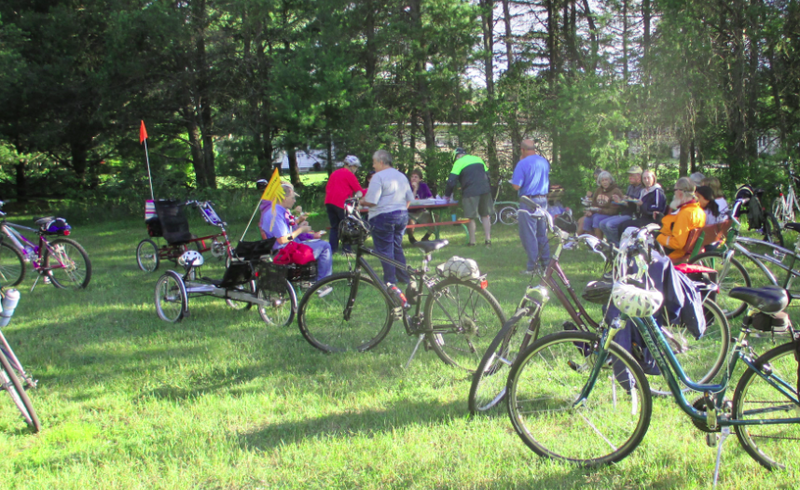 A Poky Pedaling Potluck Picnic is the perfect pastime for a lovely June evening. I look forward to sharing Bike Fun with all Poky Pedalers this Tuesday.